Can Nokia N8 save the Nokia brand? After facing a considerable market share to both the iPhone and Android devices, Nokia seems to finally come with an ace with it's new cell phone Nokia N8. 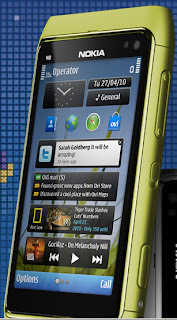 Nokia N8 is said to be the best Nseries cell phone ever made. The N8 boasts of a 680 Mhz internal processor and has an in built memory of 16 GB. The memory can be extended via a memory card to 32 GB. The in built RAM is 256 MB and the ROM is of 512 MB. The Nokia N8 runs on the Symbian^3 OS. The Nokia N8 has a 12 Megapixel Camera with a Carl Zeiss lens and a Xenon flash. It seems Nokia is keen on marketing the N8 has a high end media device. The screen size is massive, about 3.5 inches with multi-touch input method and scratch resistant Gorilla glass display.